I’m back from the beach and finally getting back to normal so I headed to Albertsons to use those doubles and came upon a great find. Butter for just $1! This was at the one on 122nd and Division. The only option was salted, though I don’t know if it would be different at other locations. This was not an advertised sale, but rather a clearance deal so I can’t say for sure if this will be all locations. If someone else out there checks another store please let us all know by commenting. The 122nd store did have PLENTY of them. I only purchased 5, mainly because I didn’t want to spend more than that, but also because I still have plenty from when Fred Meyer had Tillamook on sale for $1.50, (which they do again this week with their ad coupon). 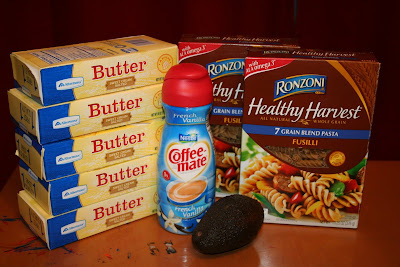 I also found Ronzoni Healthy Harvest on clearance for $1.09, used the $1/2 IP, here, and here , doubled it and paid $.09 per box. I’m heading back tomorrow to see what else I can get free or nearly free, also, be sure to check the comments on the Albertsons post before heading out yourself as some of our readers have listed what they have found using doubles. Plus, leave a comment about your own scores to help the rest of us as well. Albertson's on State Street in Lake Oswego has large Ile de France brie cheese wheels on clearance for $4.99 (I think marked down from $10.99). With $1 IP, doubled, I got two brie cheeses for $2.99 each!! Go here (http://iledefrancecheese.com), and after registering select the "Profile" page from the top menu bar and you'll see the coupon on the right side of the screen expiration 1/31/2010. I just purchased some kellogg's cereal the new extra large krispies with fiber for $1.88. Used my $2 off for 2 boxes and doubled to $3 off. good deal! 4packs of dannon activia or immunity are 2.50, minus 1/1 mq, minus double = 50 cents !! Anon – But we got more doublers in the Tuesday paper! Good 9/16-9/22. I'm in the Seattle area and my doubles end today – they are the ones that I got in the Sunday paper. Just wanted to let you know before you go in tomorrow. i found Campbell's Harvest light soup in our discount bin for a dollar. I found a $1/2 coupon and then used a double making them FREE! I also found Roman bread with a .55 cent coupon. I doubled that and got the bread for .50. Simply Asian soup products at our store in Ontario, had $1.00 coupons. If you doubled those it was .19 a piece for soup!